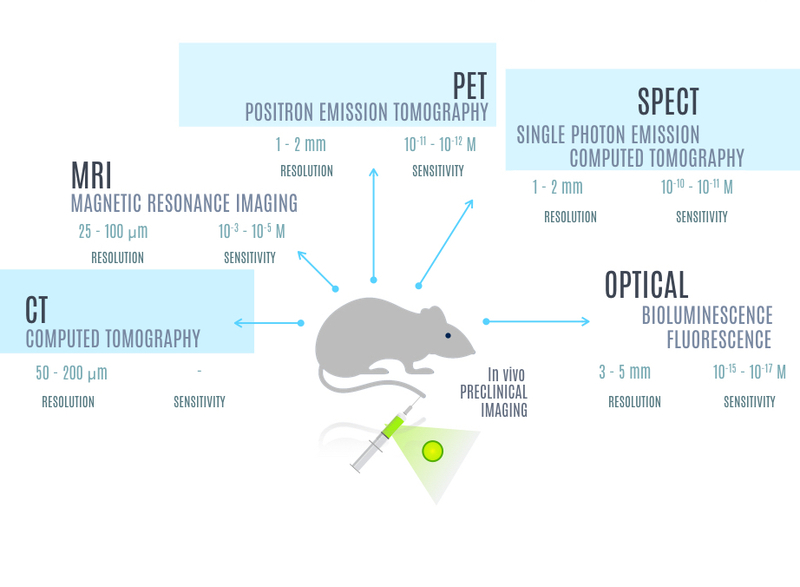 PET and SPECT are imaging techniques in which a radionuclide is synthetically introduced into a molecule (a ligand, peptide, antibody or antibody fragments etc) of potential biological relevance/interest and administered to an animal or a patient. When the radiotracer is injected into the studied subject, the subsequent uptake of the radiotracer is measured over time and used to obtain information about the physiological, cellular and molecular process of interest. Whereas PET and SPECT rely on similar principles to produce their images, important differences in instrumentation, radiochemistry, and experimental applications are dictated by inherent differences in their respective physics of photon emission. See schematic figures below for each principle. PET scans are acquired following administration of a radiotracer. The radiotracer accumulates in the tissue to be studied, and its radionuclide decays by emission of a positron (anti-electron). 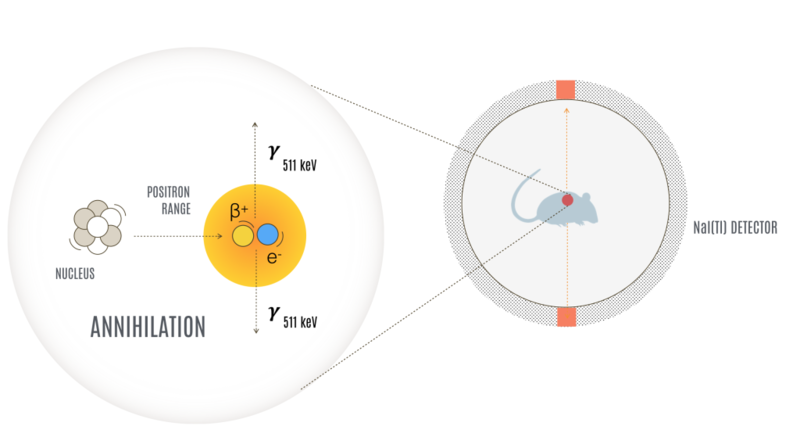 After travelling at most a few millimeters, a positron will collide with an electron, simultaneously releasing two gamma rays (photons) with an energy of 511 keV into opposite directions. These two photons are detected by the PET camera and simultaneously localized within a fixed period of time by a series of opposing detectors, which correspond to multiple rings of scintillation crystals. By collecting a statistically significant number of radioactive events, mathematical algorithms reconstruct a three-dimensional image that shows the distribution of the positron-emitting molecules in the whole body. 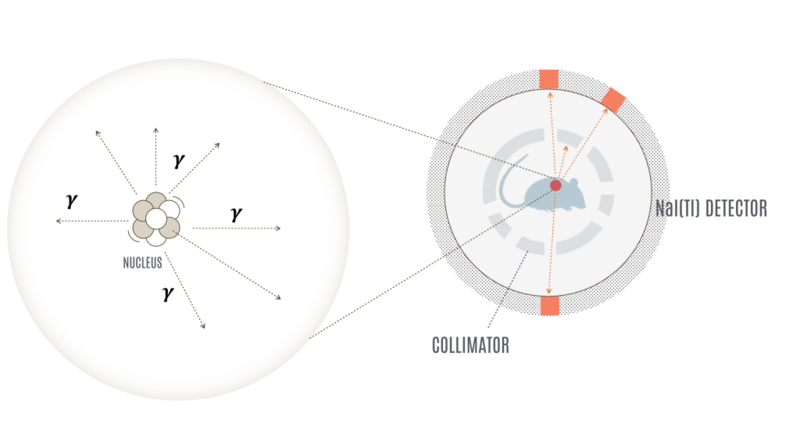 Gamma-ray photons emitted from the internal distributed radiopharmaceutical penetrate through the animal’s body and are detected by a single or a set of collimated radiation detectors. Most of the detectors used in current SPECT systems are based on a single or multiple NaI(TI) scintillation detectors. In SPECT, projection data are acquired from different views around the animal.